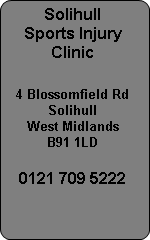 Shoulder Pain can be diagnosed and treated at Solihull Sports Injury Clinic. Frozen shoulder, rotator cuff tears, inflammation of tendons, arthritis, SLAP tears, biceps tendonitis and bursitis can all be catered for at our specialist Shoulder Clinic. Shoulder Specialist is Mr Amir Salama who is a consultant specialising in shoulder and knee conditions supports our clinics. Mr Salama is a consultant at Solihull Hospital and Solihull Parkway Hospital as well as Good Hope and Little Aston Hospitals. Shoulder pain needs addressing quickly before it becomes chronic. If you ignore the pain and take pain killing medication you can continue to irritate the condition and make it worse. Swift intervention will save you pain and money in the long term. If you do need surgery then arthroscopy (keyhole) is what is normally suggested as its far less invasive. Surgery is always the last option if physiotherapy does not resolve the problem. Supraspinatus Tendoniitis is one of the most common causes of shoulder pain. It normally involves impingement of the tendon which creates inflammation of the rotator cuff. This can normally be treated with physiotherapy or an injection to reduce the swelling and ease the impingement.